Mahatma Jasmine rice is a long grain rice variety; also known as fragrant, aromatic, or scented rice. Grown in the mountain highlands of Thailand for centuries, jasmine rice was first cultivated for the royalty of the kingdom of Siam. Named after the sweet-smelling jasmine flower of Southeast Asia, jasmine rice has a naturally distinctive scent released during the cooking process and is likened to a flowery perfume. Jasmine rice is praised for its whiteness and silkiness. Cooked, it is soft, white and fluffy. The taste of this rice enhances the traditional spices of oriental cookery. Our 2 lb. 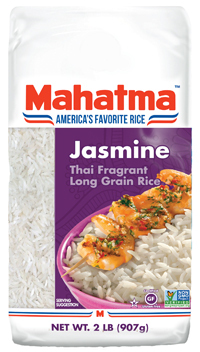 Mahatma Jasmine rice is available in a convenient E-Z open and E-Z pour spout package. Click here to download and view helpful package hints. Mahatma Jasmine rice is also available in 5 lb and 20 lb poly bag packages. As more and more Americans explore exotic and ethnic cuisine for their meals, they are seeking authentic ethnic ingredients Mahatma Jasmine rice can be an excellent "change of pace" from regular long grain white rice. Ask for Mahatma Jasmine rice at your local store Mahatma Jasmine rice, the gourmet choice in rice. In a saucepan, bring 1-1/2 cups water to a boil. Stir in 1 cup of rice. If desired, add 1 tablespoon tub margarine and 1 teaspoon salt per cup of uncooked rice. Cover. Reduce heat and simmer for 15 minutes or until all water is absorbed. For drier rice, use 1/4 cup less water. For moister rice, used 1/4 cup more water. In a 2-quart microwave-safe dish, combine 1-3/4 cups water and 1 cup rice. If desired, add 1 tablespoon tub margarine and 1 teaspoon salt per cup of uncooked rice. Cover and microwave on HIGH for 5 minutes. Reduce setting to 50% power, microwave for 10 minutes. Let stand for 5 minutes. It is recommended that only 1 cup of rice be prepared in the microwave at a time. Microwave ovens vary. Cooking times are approximate. For cooking rice in excess water, click here. If you have a pressure cooker, here are some quick tips for cooking rice.